Everyone warned me that when I turned 40 the dreaded mammogram would be there to welcome me. It is like a rite of passage into the middle age years for every woman. I had my official introduction to the infamous squeezing machine just a few weeks ago. Though not as bad as my imagination had made it, it was still pretty close. While amazed that someone so brilliant actually invented this potential life-saving procedure, I still see a lot of room for improvement in its user-friendliness. It’s clunky and awkward, not fitting to a woman’s contour in the least. But, I suppose it gets the needed job done and that’s the most important thing. I couldn’t help but chuckle when the mammography technician kept reminding me to “just relax” while she contorted my arms unnaturally and commanded me not to breathe or make even the slightest move while the procedure took place. My thoughts fell out of my mouth at that moment, “A man must have invented this machine.” Women are just too compassionate, I mused. The nurse just smiled knowingly. As soon as it was over, a deep breath and sigh of relief, knowing that I wouldn’t have to go through it again for another year at least. I was out of there like a shot. But the very next day, I got an unexpected call back from my doctor informing me that they would like to see me back for further testing on a spot they were unable to identify. So, within a week, I was back in the midst of those merciless jaws. 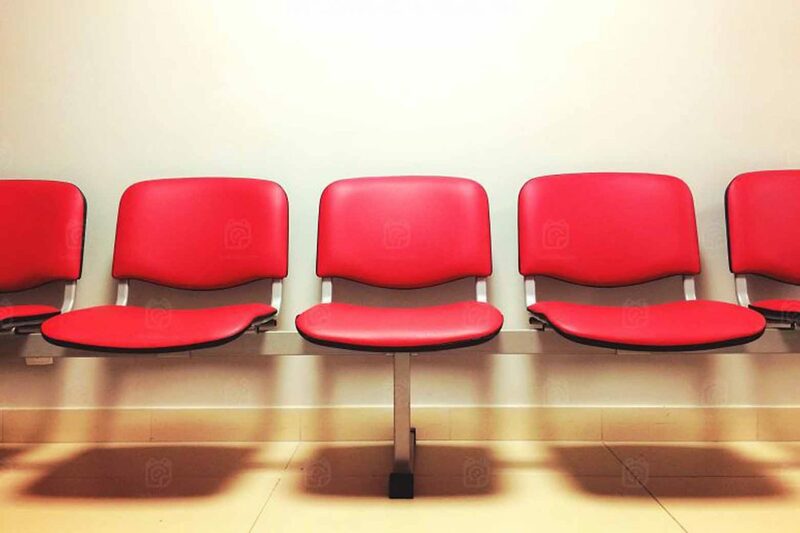 In some waiting rooms, you have a variety of issues and concerns represented among the patients, none of which you are privy to. The waiting room for mammogram call-backs is one of shared experience. Everyone present knows why she is there and the potential issue at hand. It’s a room full of women of all ages sitting around in pink hospital gowns, experiencing the vulnerability of being braless in a public space. Yet, ladies go about things as if they are normal: reading magazines, checking their phones, and drinking complimentary coffee—all the while, under the surface one can feel the uneasiness as each name is called to follow around the corner to whatever awaits. For a first-timer, such as myself, it was a very real and raw waiting room experience. Nothing so boring and distant as the others I have been in, where people hesitate to even make eye contact. Here, there was a seed of community extending even among the nurses and office employees who referred to each patient as “sweetie” and ran the halls with a smile and a purpose. I was so very impressed with the thick presence of humanity residing alongside the cold machines. People aren’t just wearing pink because they like the color, but because they believe in the cause. People aren’t wearing pink because they like the color, but because they believe in the cause. I was ushered from the second unclear mammogram to a following ultrasound. After thorough testing, the ultrasound technician assured in the end that I was in the clear. All she seemed to see in question turned out to be just normal lymph nodes. It took me a minute to process the good news as I had already entertained the chance of the alternative. As I slowly came down off the adrenaline high of concern, the nurse casually talked to me about family, the latest news events, etc., as if she was intentionally helping me to transition from the doctor’s office to the outside world again. I was emotionally wiped and physically exhausted from the afternoon’s ordeal. I walked out of the doctor’s office and down the long hospital hall processing. Then I walked into the elevator that brought me closer to my known world of normal. The normal that I had questioned on my way into the office, the one subject to change. Yet, without much more than a 10 minute buffer, it was back to the life of a 40-year-old mom, scrambling to make dinner plans, organizing pickup for the kids, and so on. I couldn’t help but think of the women that exited those same doors and got into their cars with less than welcomed news, going home with the weight of the world on their shoulders. One afternoon in such a place put so much into perspective for me. I admire you ladies, and I count my intersection with just a few of you as one of life’s most enriching moments. I am also reminded that we are not alone. That even in a waiting room, there can be someone who understands more than you know, so don’t be afraid to look up from your magazine and make eye contact. You’ll also like 10 Things I Learned About Cancer as an Oncology Nurse, True Beauty is Found in a Woman’s Strength, When Life Gives You a New Normal, Anatomy of a Strong Woman, Take a Moment to Stop and Listen, and 9 Marks of a Beautiful Woman (on the Inside).